We love hearing about the cool apps and projects that our users have created. Our Text Analysis API enables users to make up to 1,000 hits per day while they test out their ideas. That means you can analyze up to 1,000 URLs, tweets, customer reviews, documents etc, every day! Going forward we will be regularly sharing these awesome user-created apps to show you what is possible with a Text Analysis API like ours and hopefully inspire you to create something cool and useful yourself. To kick things off we’ll focus on two super cool tools, a Twitter Lead Generator called Tweelead and a Conversational UI for Slack called Somerset. Twitter is a gold mine of useful information that is just waiting to be tapped. Because of the character limitation of tweets (140 characters but soon to be more), Twitter conversations are short, concise and immediate – making them small but powerful nuggets of public opinion. The idea behind this app is quite simple – to discover, understand and participate in Twitter conversations relating to particular keywords or brands, as they are happening in real-time. AYLIEN user Farhad, who is co-founder and CEO of Taskulu, shows us how he uses our Text Analysis API to to generate actionable leads from Twitter. Farhad knows that Twitter is an extremely popular avenue for customers to express their opinion on a brand or service. Why? Because Twitter users don’t accept the standard reply ‘within 1-2 business days’. In fact, 72% of Twitter user who use the social network to make a complaint expect a response within an hour. As a marketer, you want to reach people who are unhappy with your competitors’ product or service, and this is exactly what Tweelead is designed to take advantage of. So we know that people out there are unhappy and therefore may be open to hearing about your product. Now how do we find them? As a phone manufacturer looking to increase my market share against these two competitors, I now have an auto-updating spreadsheet with my ideal target users. Farhad has published the code for generating Tweeleads on GitHub. You can also find the documentation and instructions for setting it up on the GitHub page. Copy this spreadsheet to your Google Drive. You can follow Farhad on Twitter @farhad_hf and be sure to check out his flexible task management app Taskulu. As we’re sure you have noticed, chat bots, conversational UI’s and personal digital assistants are becoming more and more popular. It’s not only tech giants like Google and Facebook that get to have all the fun creating them however, as AYLIEN user Sam Havens shows us with his conversational UI for Slack, Somerset. Sam likes sharing interesting articles with his team on Slack but found that not everyone on the team shares the same interests. Sam then decided it would be great to be able to auto-generate a summary of an article so people can decide whether or not it is worth their time. Botkit and AYLIEN’s Summarization endpoint. Sam goes through the whole setup from familiarising yourself with Botkit to integrating with our API. Try it yourself here. You’ll need your own AYLIEN app_id and app_key for our API which you can get by signing up here. In no time at all, Somerset was producing immediate article summaries at Sam’s request. Our API has a total of 13 endpoints that you can take advantage of should you choose to create your own conversational UI, or any other app. Perhaps you want to extract the named entities (people, places organizations etc) from an article or news story, or perhaps you would like to know whether the sentiment of a particular piece of text is positive or negative. All these features are available on our easy-to-use demo. Have you created something interesting with our API? We would love to hear about it and who knows, you may be the star of our next User App Showcase! Ready to get started? 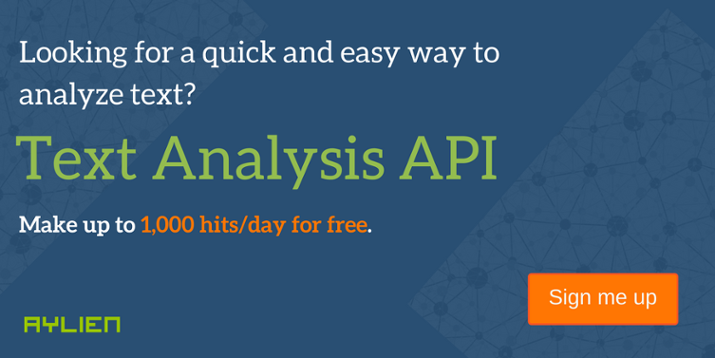 Click below to get access to our Text Analysis API.